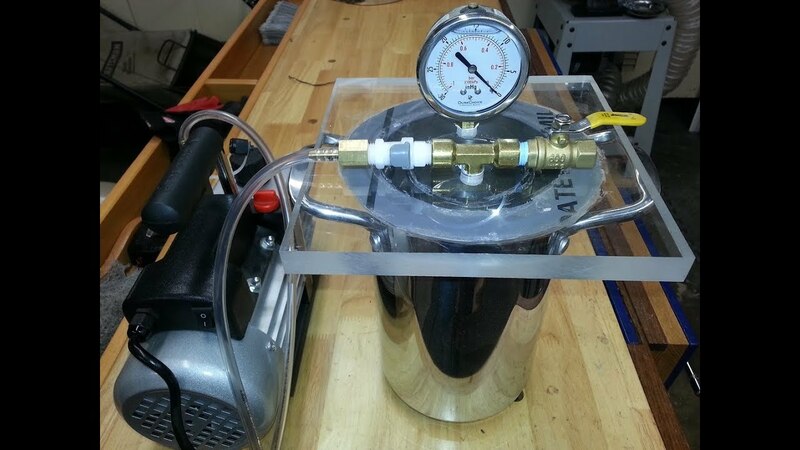 I decided to make my own vacuum chamber from an asparagus steamer pot, and a vacuum pump from Harbor Freight, for stabilizing some turning wood. Below is a link to a long-ish video of my setup. Seems to work pretty well, and relatively affordable. Thanks for watching. That is a nice vacuum chamber! Going to turn some more pens? Thanks Hank, yes this is primarily for stabilizing pen blanks. Hope to be able to complete the stabilizing and do some pen turning very soon! Excuse my ignorance, but how does vacuuming stabilize wood? removing moisture quickly? How long do you apply a vacuum. Can you pump it down then close int he vacuum and leave the pump off? OK. I looked at the video. I guess you submerge the piece in the stabilizer fluid, evacuate it all, then let the stabilizer seep into the pores/channels of the wood? Last edited by LCHIEN; 09-13-2018, 12:00 PM. Yes, the vacuum draws the air out, which in turn pulls the stabilizer in once you release the vacuum. Demo will be the subject of my next video. Also forgot to mention that after drawing in the stabilizer, the wood has to be heated to cure it. Asparagus steamer pot?? My wife loves those things, and her steamer just died. Yesterday she was trying to find something great as a replacement. Details? I didn’t watch the video......handicapped by very slow dsl. Where did you source the thick piece of lexan? What do you use for stabilizing liquid? I have a similar vacuum pump / large heavy glass jar, a surplus medical device I think, that I find myself using for a lot of things. It’s a wonderful brake bleeder, it can start a siphon on a fuel tank quickly without having to get a mouthful of gas. I’ve used it to pull glue and fiberglass into cracks, nail holes and voids in wood. My neighbor uses a vacuum pump like this to pull out small dents, hail damage from cars and trucks. Building one of these devices is a nice shop tool shop addition. Bill, my vacuum chamber is a thick glass jug, probably one quart. Instead of a lexan cover it uses a large tapered rubber stopper. A glass jar is capable of withstanding a lot of vacuum and I believe that a gallon jar would work equally as well for larger objects, and are easier to obtain than a stainless pot. The clear jar also has the advantage of being able to observe what is going on inside the chamber. Do you completely submerge your wood piece in the cactus juice? Any idea what cactus juice really is? Can you think of any reason this vacuum chamber wouldn’t work using with linseed oil, Watco, or any other penetrating oil? Metal pots are used because of the possibilities of glass breakage as much as anything else. Many pen turners purchase HF 2 1/2 gallon paint pots and use them. Paint pots can be used for both vacuum and pressure. Vacuum is used to pull the air out of cellular material and then let released pressure drive the stabilizer into the wood. For some people, after the stabilizer quits foaming, they put pressure to it to drive the stabilizer further into the wood. This vacuum and pressure is used more in dye situations. For casting one's own pen blanks out of different material such as epoxy types or plastic resins, or other, pressure is used in the casting process. Under pressure, bubbles that form from stirring and mixing are minimized. Pressure from 30 psi to 50 psi are the norms. This really helps, there is a world of difference between unpressurized casting vs pressurized casting. Some casting agents set up in as little as 5 to 7 minutes while some casting agents take 12 hours or so, therefore, knowing your casting agent and the time allowed is critical in some situations. And, different casting agents yield different results. Some material can be too brittle for the average user but make a better final finish; some material have less shine, some more, some change color (yellow) over time, some do not. Lots of variables on casting. For some, the longer curing times require less or no pressure as the bubble come to the surface and dissipate. All blanks are, or should be completely submerged in cactus juice or other stabilizing agent. BTW, there are dyes for mixing with cactus juice (or other stabilizing agent) to color/dye blanks if wanted. Cactus Juice - I will let Bill explain that. I have used it but it is something in my mind like thinned and clear "white glue". Some people place the stabilized blanks in heating chambers to shorten the curing times. I have tested, along with others over the years, with different medium such as oil based poly urethane and water based poly and other liquids. Some woods are more conducive to certain stabilizing agents than others - probably chemical reactions. I have read of those that used certain oil based finishes and the blanks were still wet inside a month after stabilizing. Different finishes can and do work, but they are not optimized for stabilizing because they were made for that purpose, hence in evaporation, they are not as effective as agents that do not shrink in curing and leave pores open. That is the problem with finishes and most oils, upon curing, they shrink and leave open pores. Last edited by leehljp; 09-14-2018, 09:36 AM. I'll order two. The wife loves artichokes and makes pens. She has a few chunks of spectacular stuff that needs to be stabilized. I'll be a hero. Last edited by Bill in Buena Park; 09-14-2018, 08:39 PM. Some posts teach you something. This post opened my eyes to a bunch of things. Thanks for sharing!